As a child, I remember playing the original Zoo Tycoon until it crashed my parents’ PC. I carefully crafted exhibits and cared for my animals until I drove myself into the red. 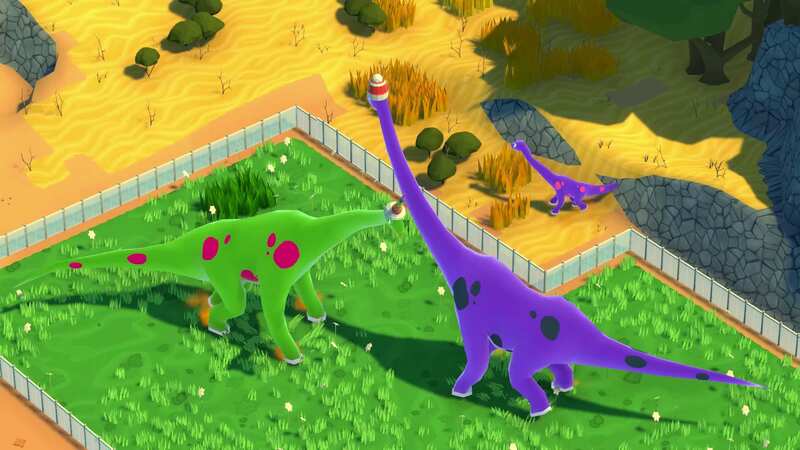 Parkasaurus is a game that’s like Zoo Tycoon, but better in almost every single way. You get to care for dinosaurs in a park that you build from scratch, and travel to unknown dimensions to dig and discover new ones. Your ultimate goal is to maximize the happiness of your guests and dinos while increasing your profits. Almost Endless Customization Possibilities – When I started the game, I was surprised that I could change just about anything. I clicked on the admissions booth to open up my park, and it also brought up the color palette. You can change the color of anything in your park, so there’s plenty of opportunity to brand it and make it your own. You can buy different types of dinosaurs, hire from a pool of people, and build exhibits with a surprising number of tools. 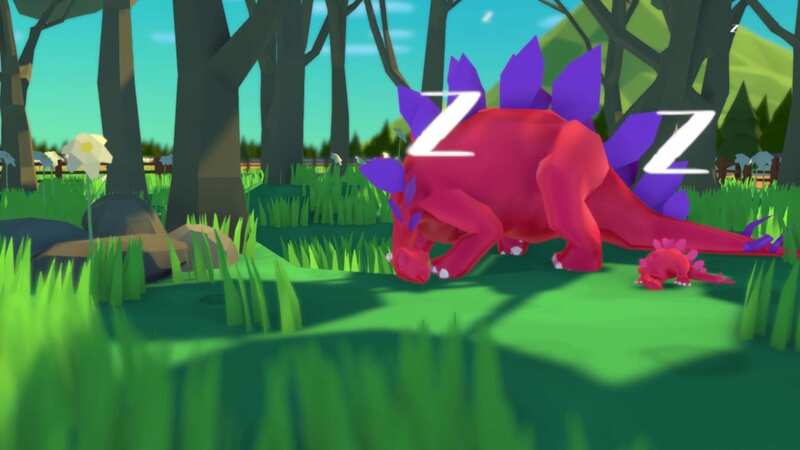 Adorable, Colorful Art Style – Your dinos are not the terrifying monstrosities that you’ll find in a Jurassic Park film, nor the nondescript specks that idly roam across the screen in Zoo Tycoon. Your dinos are heckin’ adorable, and come in a variety of shapes, sizes, and colors. The vibrant colors and intricate details (like the blades of grass, for example) improve the game play experience. Everything is pleasing to the eye. Pictured above is the research and development menu. To the left, you’ll see a vial filled with “science points.” Notice the little yellow beakers–these are things that you can fill using the points from the vial. When you fill them, you can unlock new items for your park! Easy Research and Development – This is a key gameplay aspect of Parkasaurus, and it’s executed really well. With the help of the scientists you hire, you earn science points, which you can use to unlock new tools, guest attractions, or items for your dinos to enjoy. The process is breezy: all you have to do is hire a scientist and put them in either an exhibition stand or a science center. The longer they spend working at these places, the more “science points” you earn, which you can use to unlock new features. I love that this system doesn’t rely on shelling out money, and that you can choose which areas of development you’d like to focus on. Make That Money – When I played Zoo Tycoon, I would essentially build parks and run through them until I ran out of money…which always confused me, because I would have hundreds of guests coming each day, plenty of food and souvenirs, and yet somehow, I couldn’t make enough. Parkasaurus isn’t like that. I consistently made money every day, and if I ever saw my profits going down, the end-of-day menu gave you a rundown of what you could do to improve the park. You can also view guest feedback. 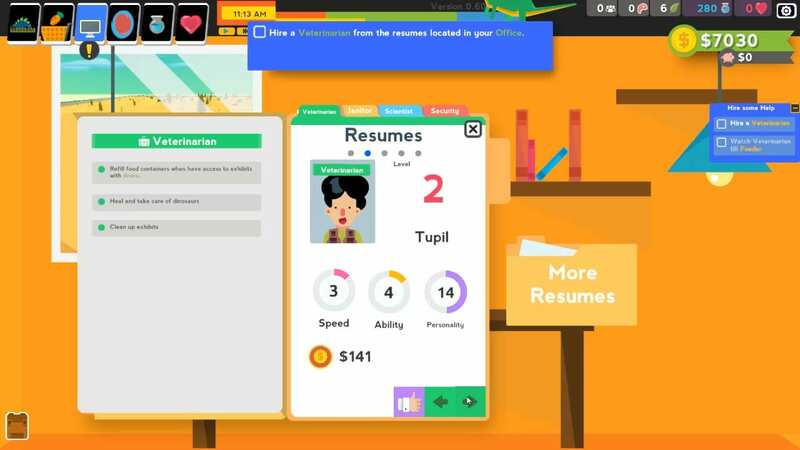 No Hard-To-Understand Menus or Tools – If you play the tutorial, Parkasaurus will walk you through everything that you need to know in order to successfully manage your park. But even if you don’t play the tutorial, I’m sure that just by trial and error, you can understand what everything does and where to find items. Thinking back to other park management sims, where the controls are often difficult to understand or worse, hard to find, I was surprised by how easy everything was. 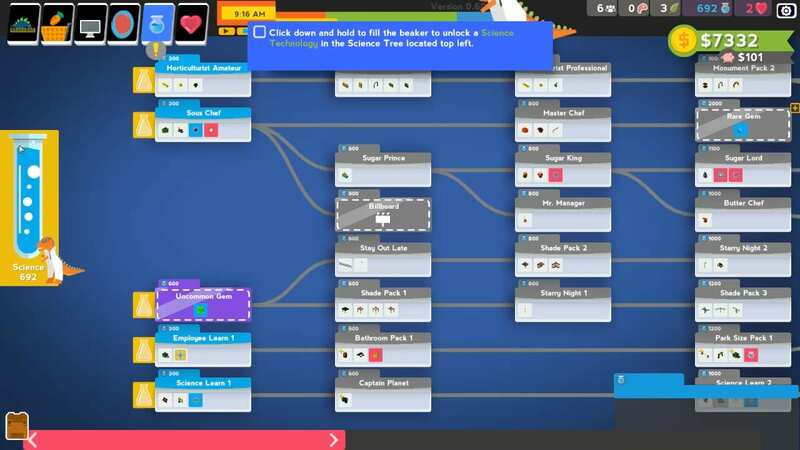 Parkasaurus lays out all your necessary tools and menus without overwhelming you. This is your office, one of the many places that you can visit in the game. This area is mostly useful to you for hiring staff. Bugs Make Controls Difficult At Times – Given that it’s in Early Access mode, the game can be a bit buggy. Multiple times I found myself deleting things that I didn’t want to delete, and unable to click away. I’m pretty sure I deleted my science center eight times, so I lost a lot of money having to build and then rebuild. In the first tutorial I started, my dinosaur ended up hatching in the water. I was supposed to tranquilize it, but my park ranger couldn’t get to her, so I had to restart. Awkward Animations – Again, this is something that can be attributed to the early access nature of the game, but animations can be…strange at times. Sometimes people will just mesh with the walls. My triceratops Violet did this so much that I’m pretty sure she just wanted to become the wall. But that wasn’t the only weird action I noticed. Take a look at the screenshot below. This is one of my scientists conducting research…in thin air. With no vials or any other type of equipment present. He stands outside the science center, and just moves his hands from one side to the other. He looks like he’s engaging in the loneliest game of charades – and Rob, I don’t freaking pay you $144 bucks a day to play games, chop chop, make me some science points. He told me his degree was from Yale, but I think it’s STALE. What are you doing, my dude? Lack of Warnings – At a certain point in the game, my dinosaurs kept getting tranquilized by my security guard. I had no idea as to why, and even when I picked the dude up and physically moved him across the park, he would not leave my triceratops, Violet and Sullivan, alone. Hellbent, he raced into the exhibits and fired off a ricochet of darts at them, which effectively traumatized me, because my dinos are freaking adorable and I don’t want anything bad to happen to them. “Dude,” I shouted at my screen, “Can you please stop shooting Violet for like, five seconds?” It wasn’t until I rotated my camera that I realized I had accidentally deleted an exterior wall when I was expanding their exhibit, thus making Sully and Violet dangers to all of my guests. I think this is a good opportunity to introduce an emergency system that flashes somewhere across the screen. Overall, I’m super impressed with Parkasaurus so far. Aside from the tranquilizing and the understandable bugs, I really had to dig to find things that I didn’t like about it. I found the game not only fun, but relaxing. I didn’t have to stress about money or meeting goals. Parkasaurus lets you play at your own pace, so no matter what type of player you are, it will meet your needs. 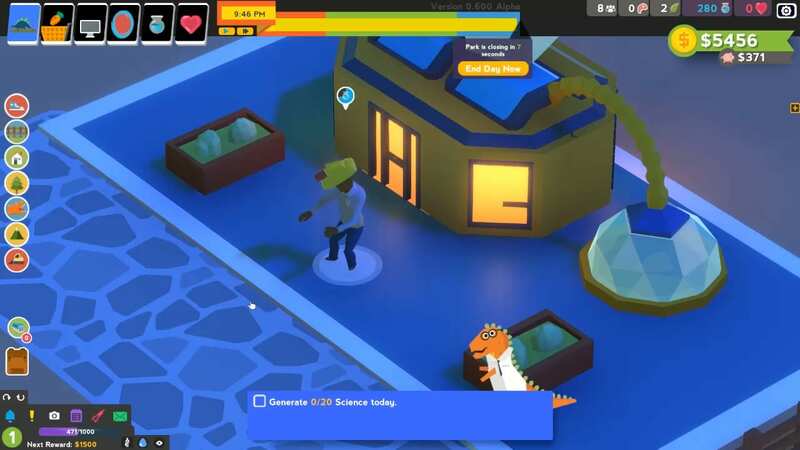 Some features are not available yet in the game, such as the gem shop, which you need in order to make new types of dinos, and the accessories shop, where you can purchase hats and glasses for your dinos to wear. I am excited to check out these features as they release, and I’m even more excited to see where Parkasaurus goes. I think it’s really going to change the way we think of park management sims. You can get an Early Access copy of Parkasaurus on Steam now. Chloe covered Parkasaurus on PC via Steam with a code provided by the developer.